Here is my latest item I have done just in time for the holidays and also that I'll be teaching a class on tomorrow at Paper Cottage. 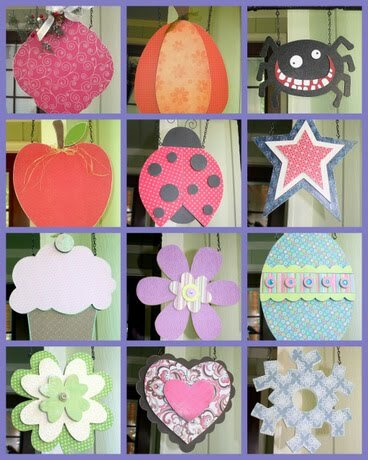 Yes, I should be out in the workshop cutting those little birds out but I thought I'd get caught up blogging for a bit! I love these Believe letters! I love the paper from Making Memories which has been selling out very quickly! It has the cutest Christmas tree shapes and colors! Plus the thing that got me were the black with white polka dots! I'm a polka dot person anyway, but I thought it was such a fun addition to your typical "Christmas" colored themed paper! I had fun with these! I had so much fun I somehow convinced my sweet sister to come craft with me and now we are going to do 2 more boutiques. The one coming up is the Holiday House Boutique that will be happening next Friday and Saturday over off of Chinden and Locust Grove in the Saguaro Canyon Neighborhood. These gals run a class act boutique with everything homemade! It should be a blast! I'll post a flier pronto! I'll try to get some better pictures of all the cute ornaments we did and plus as soon as we get the others done I'll post them too! Okay I totally forgot to put up the cute spider we did for our seasonal hanger! It was so fun to do and my little girl had a blast with the puzzle of teeth! Isn't he cute! 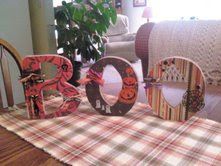 One of my favorite gals Diane Rusnick sent me a picture of her completed BOO letters she did! Aren't they to die for!!!! Just in time for Janna and her soon to arrive baby Carter! This guy was over 4 feet tall and I had to figure out how to hook him up to some rebar so he could stick in the ground. The little baby bundle was hanging off of a hook and was interchangeable. My friend Julie had seen these in yards back in Arizona and wanted something like it. I chose to go the more realistic route instead of comical and it was a blast to make! I've got to get our December Seasonal Hanger cut out today and done and I think it'll be a beauty. Will post as soon as it's done! You've got to go check out some fun sites! One is by my sister and I, I am her crazy craft co-conspiritor! Next is my sister-in-law's My Design Dump! My husband bought me my first saw from a pawn shop after a successful yard sale and I've been in love ever since!..with the saw and my hubby:) I personally cut and design everything I do and I'm always up for a good knock off! I specialize in Craft Groups & Super Saturdays and offer group rates. All items can be ordered in unfinished wood or completely finished. I love working with wood! Some of My Favorite Local Gals!